Our Western Style kitchen hutch features a hidden wine storage area. 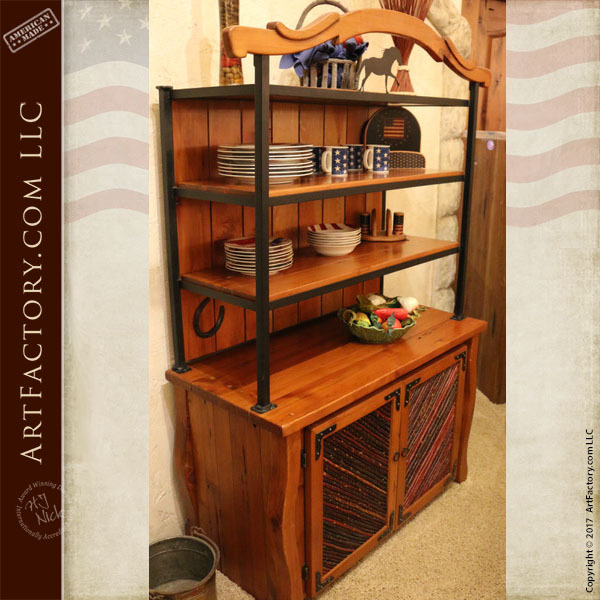 At ArtFactory.com, we can build custom wooden and iron cabinets of your dreams as a matching set. This kitchen hutch can be purchased individually, or as a set with grain matched kitchen furnishings. It features an elegant, Western inspired design that can be easily converted to lodge style, European, or any other style of your choice. It can be built in any size that you need, for either residential or commercial use. Like all of our wood furnishings, this Western Style kitchen hutch is handmade from all natural, air dried, full length timber. We build our kitchen furniture using genuine exotic solid woods. Fine furnishings are never built with faux woods, particle board, or veneers. That's why when we say solid wood, we mean "The Real McCoy". In addition to top quality materials, all furnishings are hand hewn by master craftsmen using mortise and tenon joinery. All iron framing and decorative iron elements are solid wrought iron, hand hammered over a coal forge by our master blacksmiths. The natural willow branch inlaid doors give this Western Style kitchen hutch a unique, artistic touch. This type of materials and craftsmanship makes for fine art furniture that will stand the test of time. Our solid wood hutches are built to be heirloom quality products that can be passed down, and treasured forever. We are so confident in the quality of our products that as a result, we guarantee everything forever. Like all of our door, gate, and cabinet hardware, these ring style pulls on our Western Style kitchen hutch are solid wrought iron, hand forged by our master blacksmiths. We finished this Western Style kitchen hutch, and all of our fine art furnishing using a many step open grain color infusion process. These finishes are hand rubbed, with curing times between each process. This includes multiple step processes to infuse the many stain colors into the grain of the wood, with multiple processes, of lacquer, waxes, and oils that allow the finish to be in the wood not just on the surface. This allows for by simply cleaning with oils to create a natural patina that will improve in appearance over time. We offer hundreds of different finish color choices. Unlike paint, sprays, or urethanes these finishes will not fade, flake, or chip over time. All of this adds up to a finish that meets world class fine art specifications, and will stay beautiful for generations with little or no maintenance. Every product from ArtFactory.com is designed by, and built under the supervision of award winning artist H.J. Nick. Before any product leaves our world class factory, is personally inspected and signed by H.J. Nick. This signature is to assure that the quality and craftsmanship have been found to meet all world class fine art qualifications. This ensures of an investment quality piece with future appreciable value in antiquity. In fact, our combination of fine grade materials, and master hand craftsmanship allow us to offer a quality of product that is unmatched anywhere at any price. When nothing but the best will do, call us at 1-800-292-0008 for pricing on our Western Style kitchen hutch, or any or our fine art quality home furnishings.